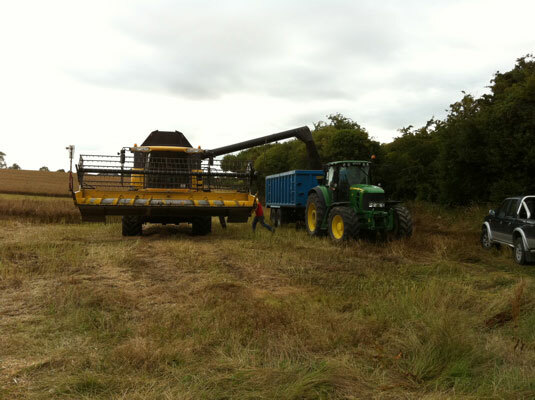 It was another fantastic day in the Boyne Valley – very warm and sunny but with some cloud cover in the afternoon. Cattle were moved into the field where our site cabin is located so we had to erect a new electric fence to keep them at bay! There was a lot of curiosity at lunch-time but the fence did its job well. 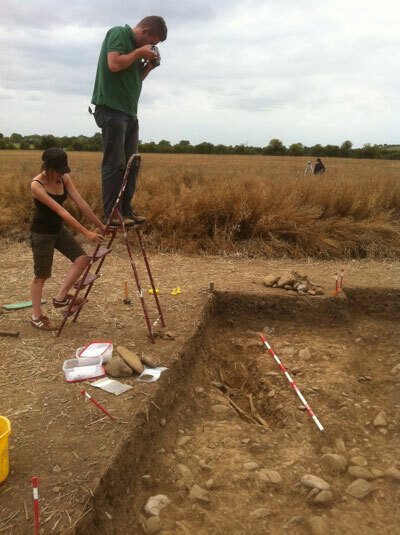 Laureen and Matt at work. 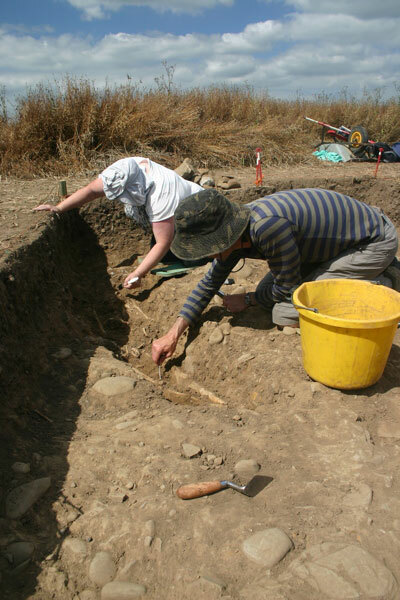 We were joined again on site by Laureen who came to assess for herself the skeleton that was gradually being revealed in Cutting 7. 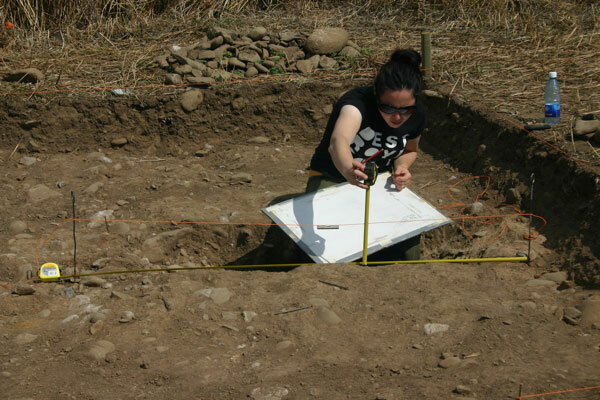 She very kindly stayed for most of the day working on the burial and very good progress was made uncovering the extent of the remains. 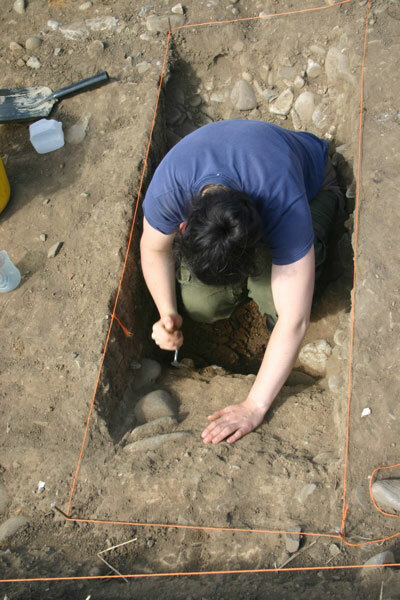 The bones are in fairly poor condition and Laureen is certain that they will not all remain intact when lifted so it was particularly informative for her to be on site at this stage to make her own observations as she will ultimately be writing the technical report on the remains. 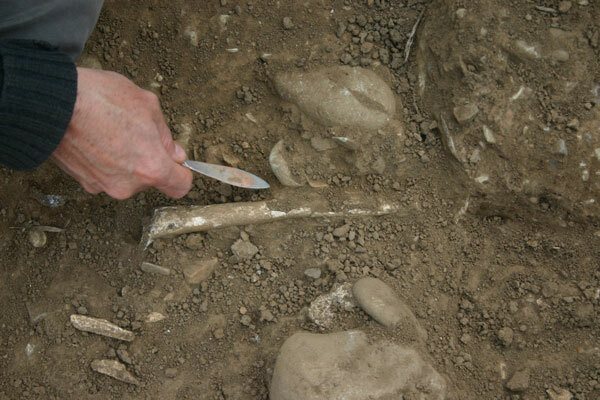 She was able to tell us that the burial is that of a female probably in her mid twenties. There is no sign on the bones at this stage of the cause of death. 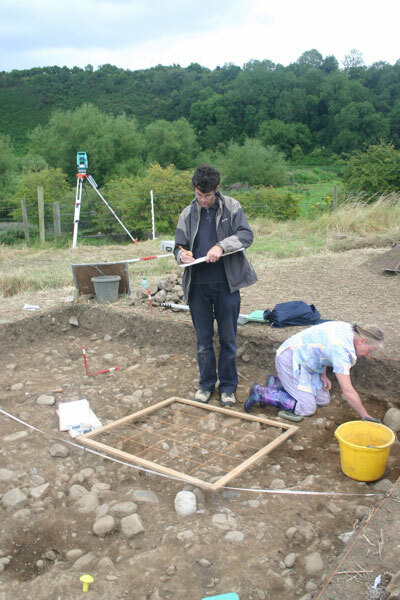 Control points were installed around the grave cut which will be later surveyed in by total station and detailed photographs of the burial were made. 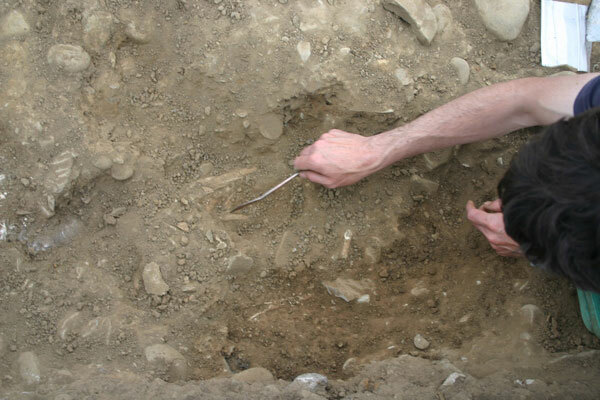 Me taking a picture of Burial 2. Elsewhere in Cutting 7 Ciara and Mags wrestled with the identification of natural versus disturbed soil, and again, despite the hot dry conditions, good progress was made. 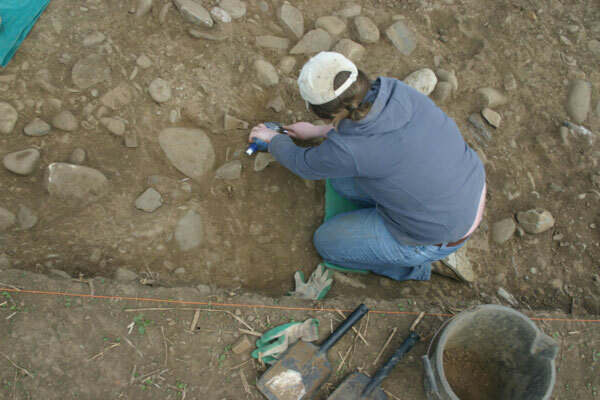 The same story was unfolding in Cutting 8 and a final working-over of the surface of the cutting with mattocks helped to identify the locations of some possible additional grave cuts. 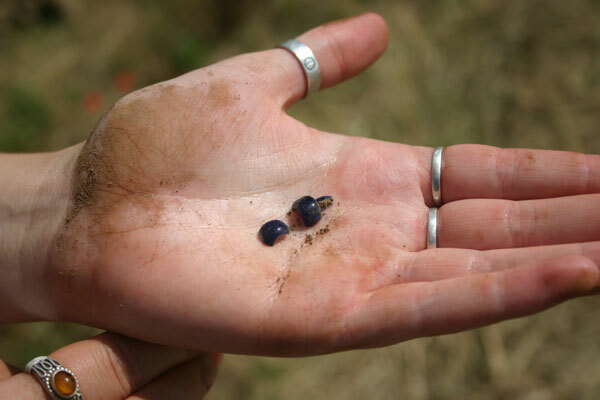 The find of the day today was Sophie’s discovery of a blue glass bead. 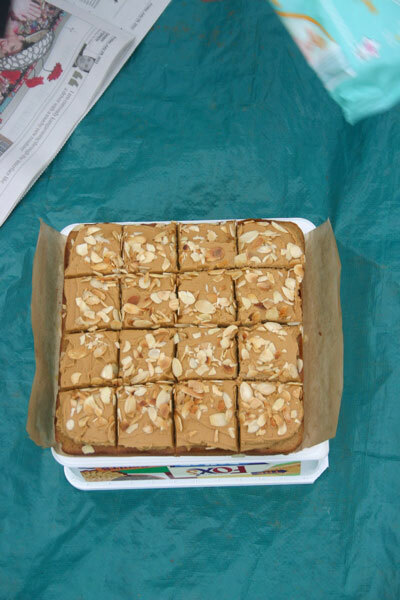 Unfortunately it was not intact. 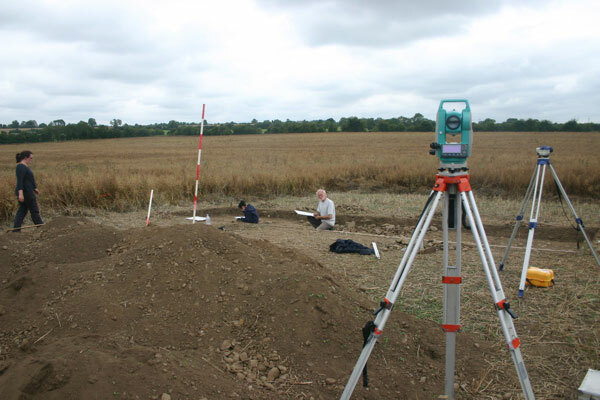 Rain is forecast for tonight and, as I write now, there is rain falling, so this will do the site some good and help us to distinguish the soil colours. In Cutting 6 Eimear continued to draw the sections there and Niamh continued to dig one additional section. This is not behaving as expected as it is a lot deeper than we thought it would be. We will finish excavating it and probably record it tomorrow evening or Friday morning before backfilling. 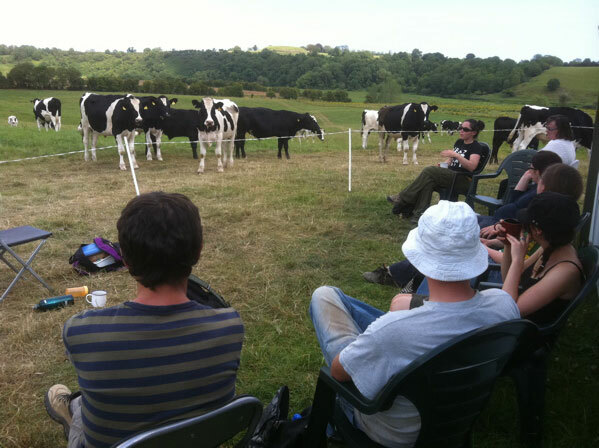 We had some additional visitors to the site today and they couldn’t have picked a better day. Ann Lynch and Con Manning of the National Monuments Service came to take a look at the site on their way to see the excavations at Bective. 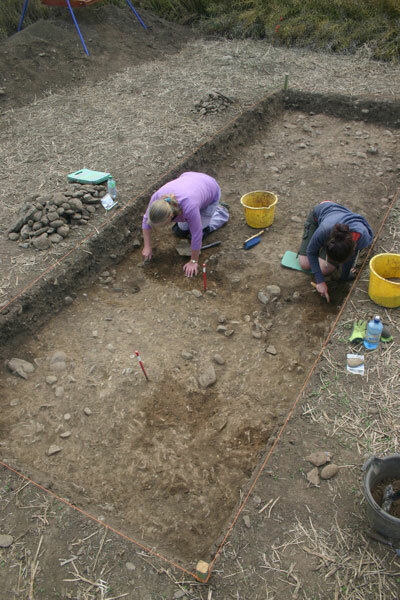 They did very well to find the site! 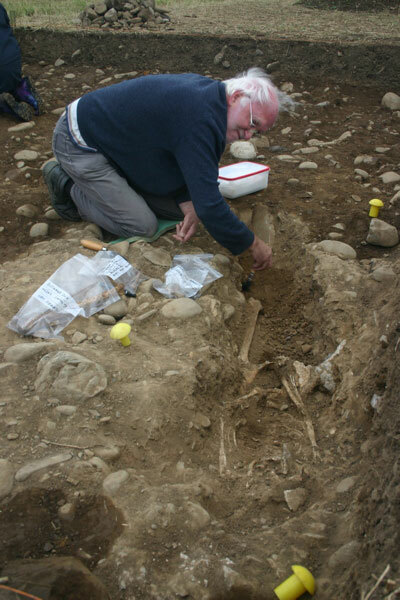 Professor Gabriel Cooney also visited on behalf of the funding authority, the Royal Irish Academy Committee for Archaeology. 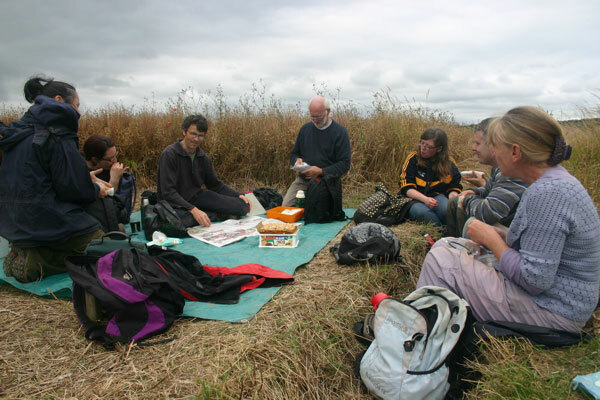 The discussion of the progress on site and the findings so far was very useful. 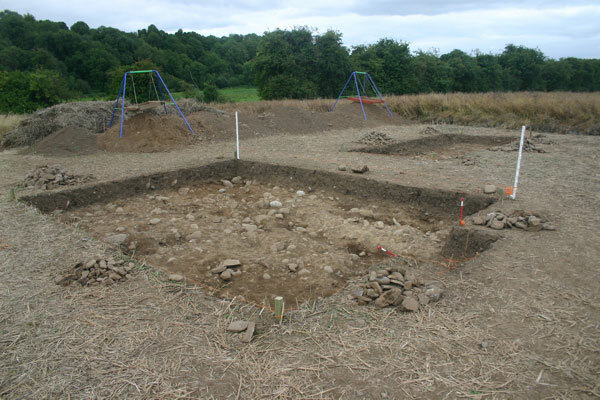 It is clear that the information being revealed by the excavation is adding significantly to our knowledge of early medieval activity in the region and the story of the Brú na Bóinne area. A good result for our efforts. The Cutting 7 team in action. The weather was with us again today. From a calm but overcast start, the day rapidly improved with strong sunshine and high temperatures all day. A few more days like this and we would have a heatwave. 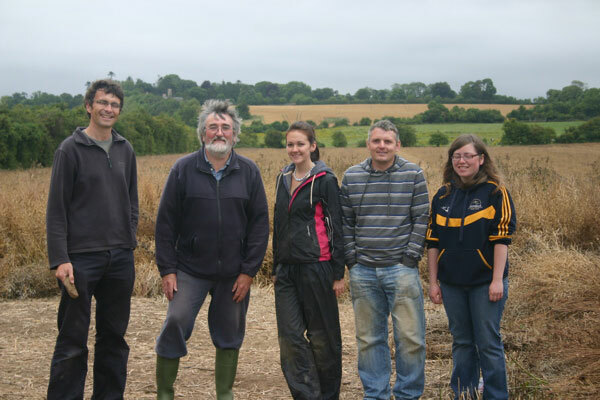 The work continued from yesterday (Monday) with Matt, Lisa, Ciara and Mags all concentrating their efforts on Cutting 7. 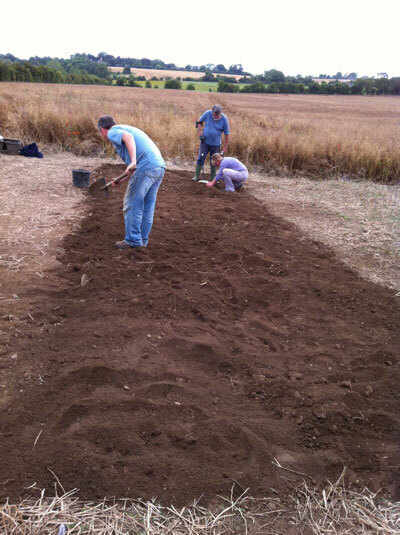 Although we had (foolishly) thought a while ago that this Cutting was almost finished with nothing of major interest in it, as we have become more familiar with the soils it has gradually become apparent that there are, in fact, quite a number of features. 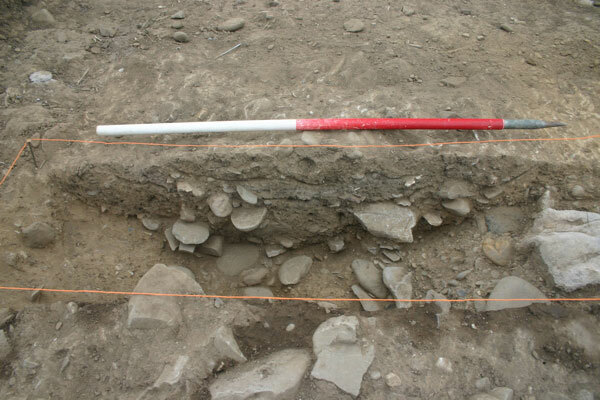 The problem is that the lowest layer of soil in the cutting above the natural, undisturbed soil looks almost identical to the natural itself. The hot dry weather is not helping as it is drying everything out to a uniform pale compact yellow crust. 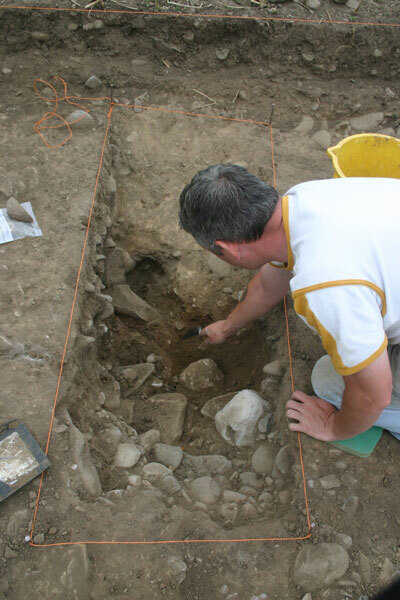 This process of additional discovery started when Matt went to lift a fragment of cranium which looked at first to be an isolated piece, possibly disturbed from a long-gone burial. 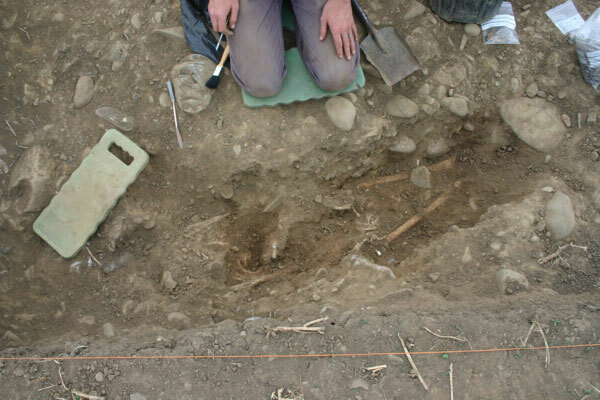 When he started to excavate around the fragment, it quickly became clear that it was within a pit containing more bone, and this pit on further investigation, revealed itself to be another grave. 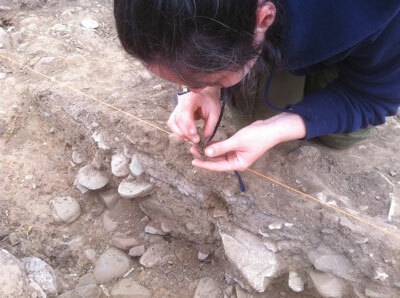 As I outlined yesterday, human burials receive the greatest amount of meticulous care and attention when they are being excavated and recorded and thus take some time to deal with. 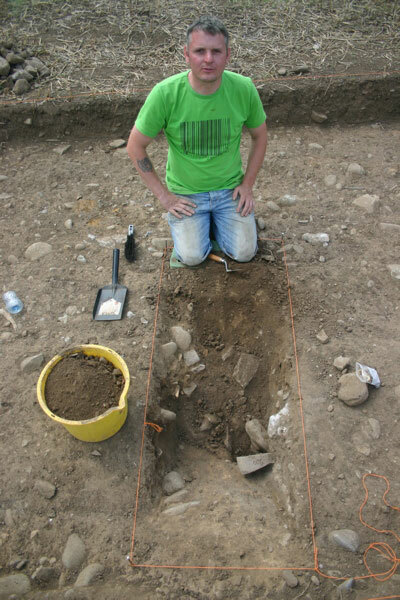 Today, Matt continued to work exposing the ‘new’ grave and we plan to record and lift it tomorrow. Elsewhere in the cutting, a number of suspicious features were identified which might very well be additional grave cuts. 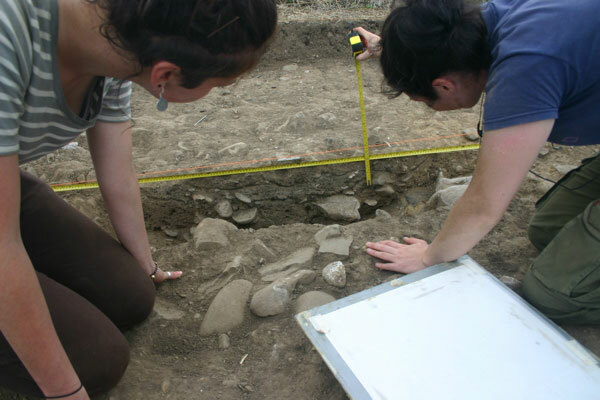 We do not plan to disturb or excavate them but will record the extent of each of the cuts and note their positions. Eimear searches for the edge. Eimear and Sophie draw the section. 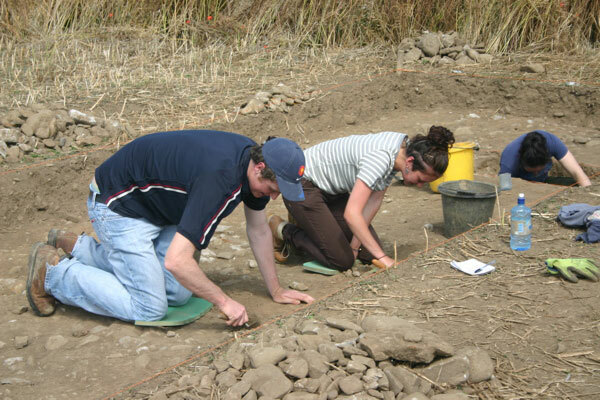 Over in Cutting 6 Eimear continued to take down the remainder of the section Darren had been working on. Again, there was some close discussion of what actually constituted natural, and the decision was made more difficult because it seems that there was a certain amount of redeposited natural lying directly beside and within the cut of the ditch. 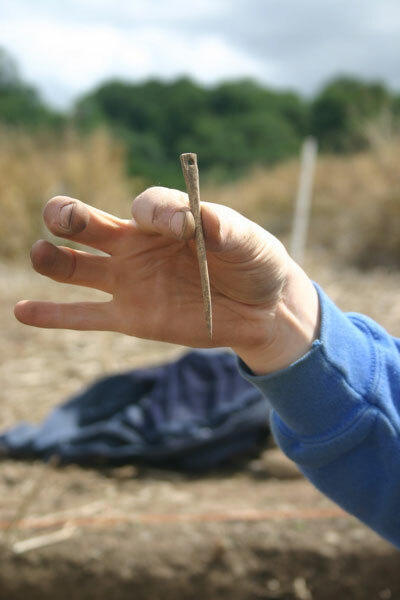 Eventually, after some careful trowelling, and after a flint flake was discovered in the redeposited natural, confirming that it must be redeposited and was not undisturbed, we found the actual edge of the cut of the ditch and the section was prepared for a photograph and drawing. Fergal and Sophie in Cutting 6. We had a visit today from Fergal Nevin, an MA student from UCD who is in the middle of writing up his MA thesis at the moment. 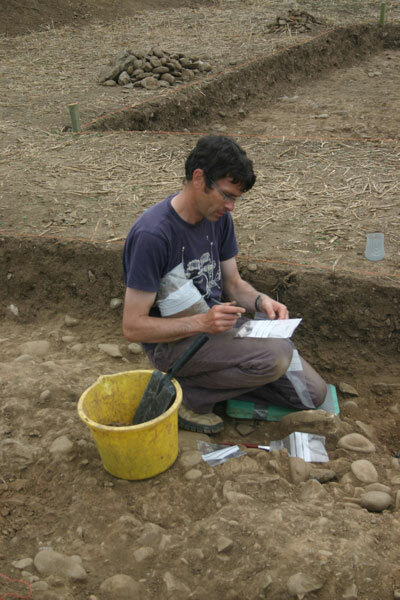 Fergal had carried out a soil phosphate survey back in May of this year as part of his research and is comparing the results of his survey to the geophysical survey data from the site. 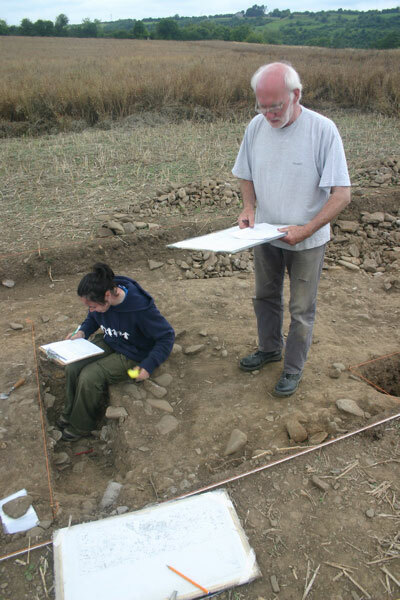 He found it very useful to come for the day and observe the archaeology first hand in the area where he had surveyed a few months earlier. We wish him the best of luck finishing his thesis. Today the weather started out dry but quite grey and overcast. As soon as we got to the site, a persistent drizzle had started and with very little wind, it seemed that this would be ‘down for the day’. Unfortunately, our predictions weren’t wrong and if it wasn’t actually raining all the time, we were certainly damp. This meant that the day was a bit ‘stop-start’ as we took an early break in the morning, returning to the cabin for a change rather than having the break on-site. 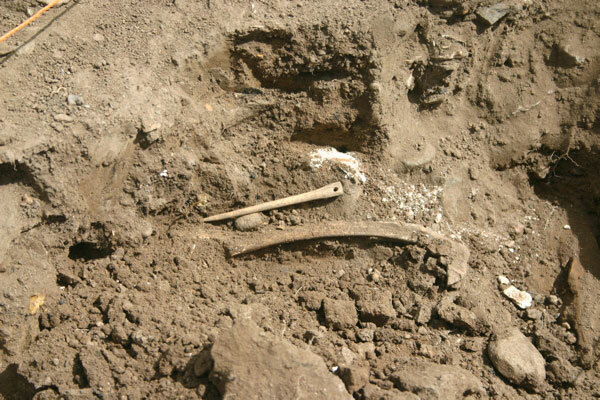 The grave cut with bone in situ. 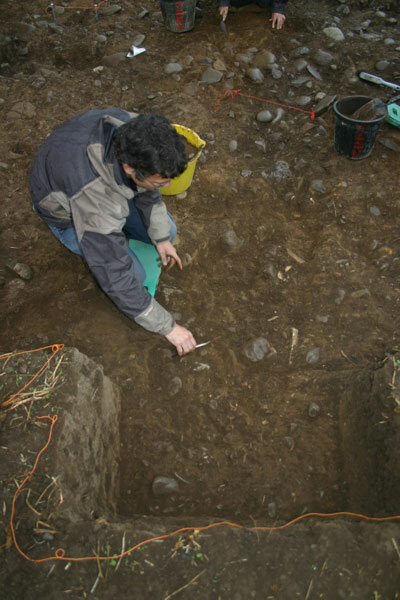 There was also a bit of procedure to be seen to following the confirmation of the finding of the burial and grave cut. 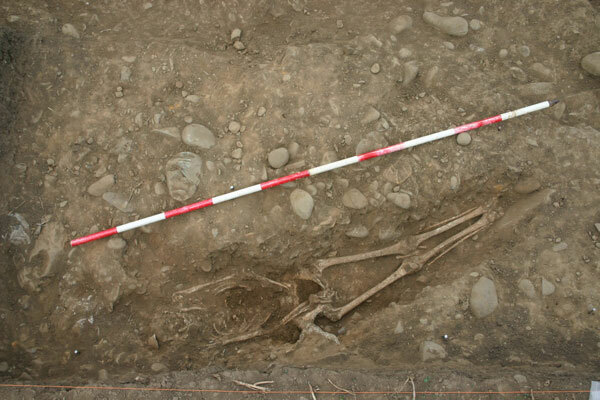 Legally, the site director is obliged to inform the National Monuments Service and the National Museum of Ireland of the discovery of human remains on site. Additionally, the local gardaí (police) must be informed under the Coroner’s Act and the National Monuments Acts. 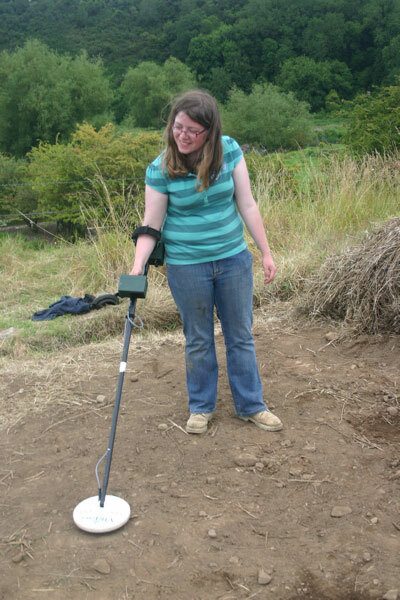 This is required because of the possibility that the human remains identified might be the burial place of a recent murder victim. 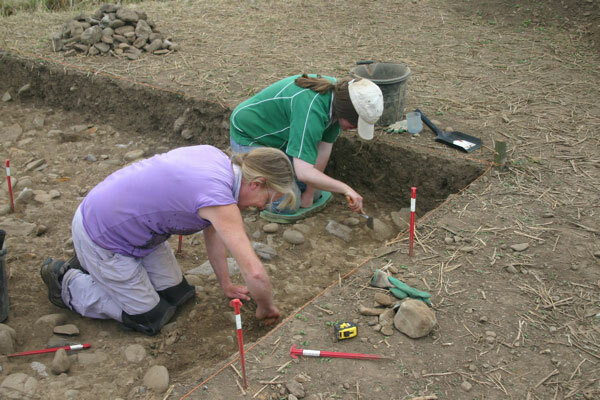 When human remains are found on archaeological sites it is usually perfectly clear that the remains are ancient but nonetheless, it is a requirement to inform the Gardaí. All the relevant notifications were made this morning. While a representative of the National Monuments Service will be visiting the site over the next few days the local Gardaí came to inspect the site immediately and within an hour they had come to check out the site and make sure the correct procedures are being followed. 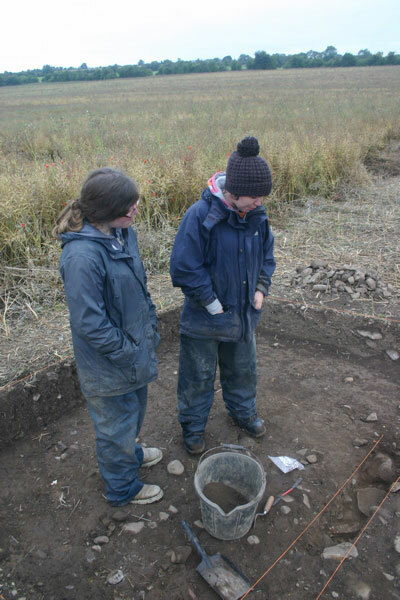 Despite the very damp conditions, they came right down to the site where we gave them a quick tour and explained why we believe the burial is ancient. 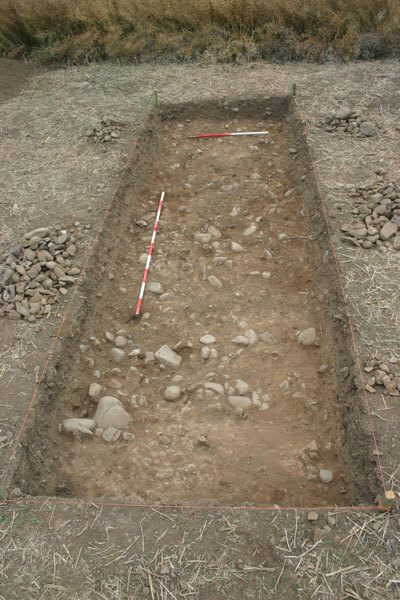 It is laid out in the standard way for early medieval burials, an extended inhumation in a grave cut oriented west-east and the body is not accompanied by any grave goods. 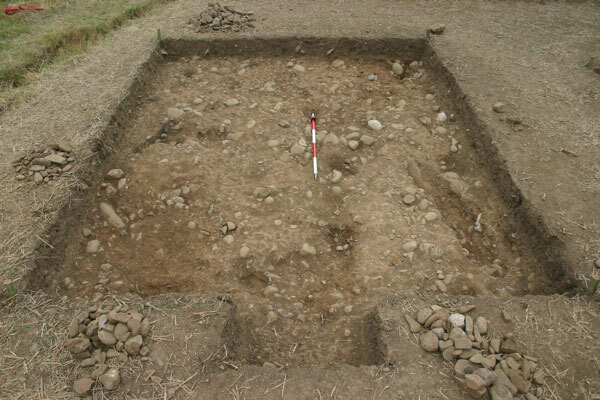 Furthermore, the cut lies stratigraphically below the very base of ploughsoil, a layer which was not disturbed any time recently as it does not contain any more modern artefats like glazed ceramics or modern iron objects. 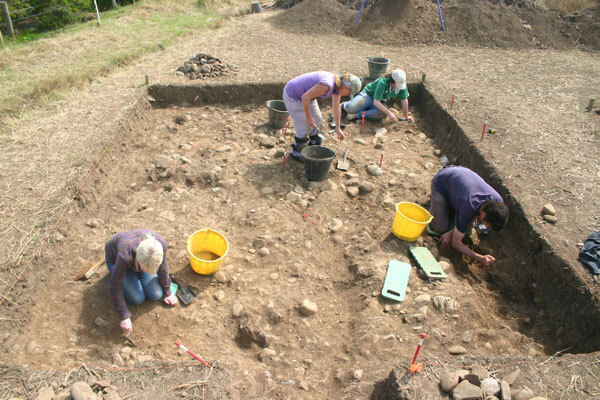 The orientation with the head to the west and feet to the east is typical of Christian burials of the period so it is definitely not prehistoric and it seems to fit well with some of the artefacts previously recovered from the site like the comb fragment and jet bracelet fragment from last year and the blue glass beads from this year. Some time later, a Garda photographer came down to the site to record the scene and we gave him a quick tour as well. This was one of the more unusual jobs he had been on recently. 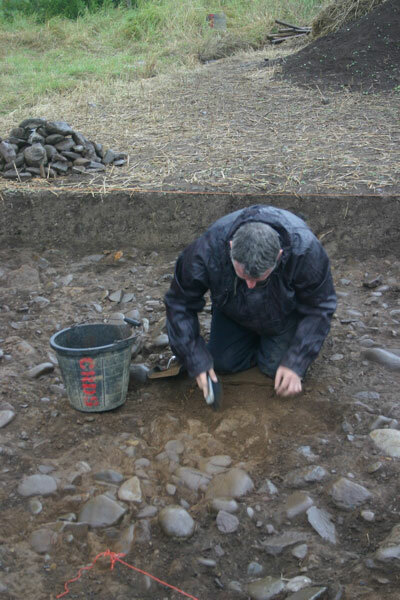 Turning back to the work we managed to get done today between the showers, Matt continued to clean up around the grave cut in preparation for a photograph while Darren and Lisa gave parts of Cutting 7 a close trowel, establishing the edges of some of the features previously identified. Mags and Sophie very patiently continued to trowel down the surface of Cutting 8 and and the one possible benefit of the wet conditions was that we were able to see soil colours more clearly than usual. 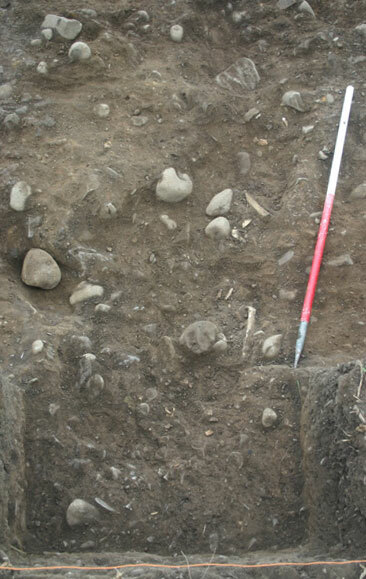 It was much easier to identify the undisturbed natural which was clearly visible as a compact yellowish soil while the covering layers, base of ploughsoil was definitely a darker brown. There was some reeorking of part of the area as soon as this was realised but it seems that we are very close to the bottom of this cutting. Damp Eimear and Ciara in Area 1. The test section in Cutting 6 . In Cutting 6 (Area 1) Eimear, assisted by Ciara, took levels on the plan and then continued the section started by Igor yesterday. The deposit there was very interesting giving way after just a couple of cm to a very pale grey ashy material with very frequent large chunks of charcoal. 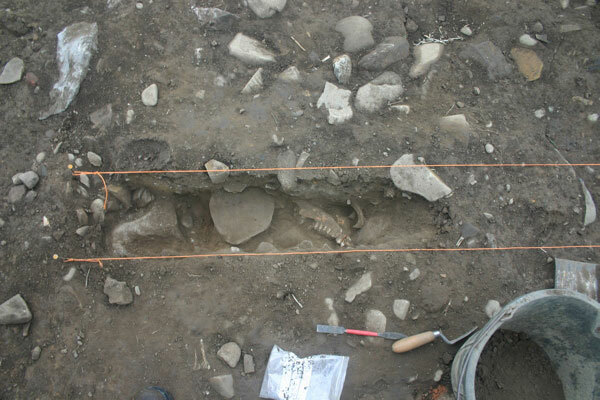 Within this fill there are several large pieces of cattle bone including a mandible. There still seems to be a goodbit of work to be done in this cutting. Hopefully we will manage it before the end of next week. The weather is meant to be better which would help. 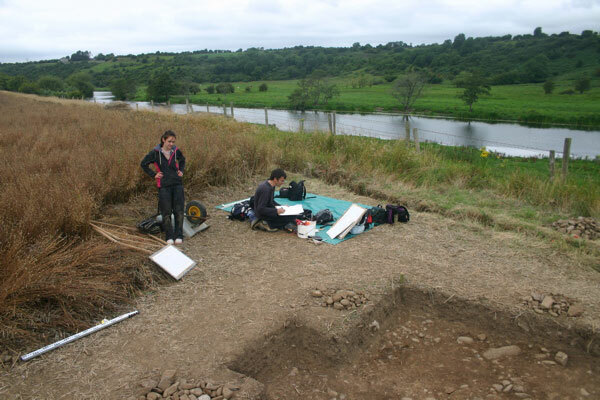 Later on in the afternoon we had more excitement when some of the crew from the Bective excavation came to have a look at the site. It is a pity it wasn’t a better day as the place wasn’t looking as stunning as it usually does. Maybe next time!